Our Invitation To Help Introduce and Share New Thought! We invite your participation in a project that could potentially help millions of people all over the world discover the “Real Secret” of New Thought. The goal of the research and demonstration project is to create, market and distribute programs that help people discover how New Thought Principles and Practices can help them awaken to their true spiritual identity, realize more of their potential and know how to manifest their ultimate destiny. The Ultimate Destiny University for Successful Living supports the shared vision by United Centers for Spiritual Living and International Centers for Spiritual Living to introduce New Thought to 100 million people. We had already created what we refer to as a Strategic Marketing Matrix TM for our inspired vision of “blessing millions, earning stewardship over billions of dollars to reach and serve more millions of people and to leave a legacy that eventually produces a trillion dollars worth of positive impact”. The adaptation below of a Strategic Marketing Matrix to help introduce 100 million people to New Thought presents our initial draft conceptualization of how that might actually be accomplished. The outer row in dark blue includes mostly existing resources including organizations (such as UCSL, ICSL, AGNT, INTA, ANTN Unity, etc.) programs, products and other resources for providing information and services to individuals. The first inner rows in green include 16 Enhancement Strategies that could provide expanded distribution of existing New Thought resources. The inner most components in gold next to the shared goal of Introducing 100 million people to New Thought in the center of the matrix present eight proposed New or Expanded Initiatives. In the left had column of this page, you will see that there is a page for each of the 16 proposed strategies for enhancing existing programs and resources and a page for each of the 8 proposed new initiatives. You can click on those links to review more details of each of the 24 proposed new and enhanced initiatives and provide your feedback and suggestions. You will also find the proposals listed on the two main pages for Proposed Enhancements and Proposed New and Expanded Initiatives. There is a poll on each of those pages so you can share your feedback on the potential viability of each of the 24 specific proposals, plus you can add your own suggestions. Please do participate however you are inspired to do so. Thank you. 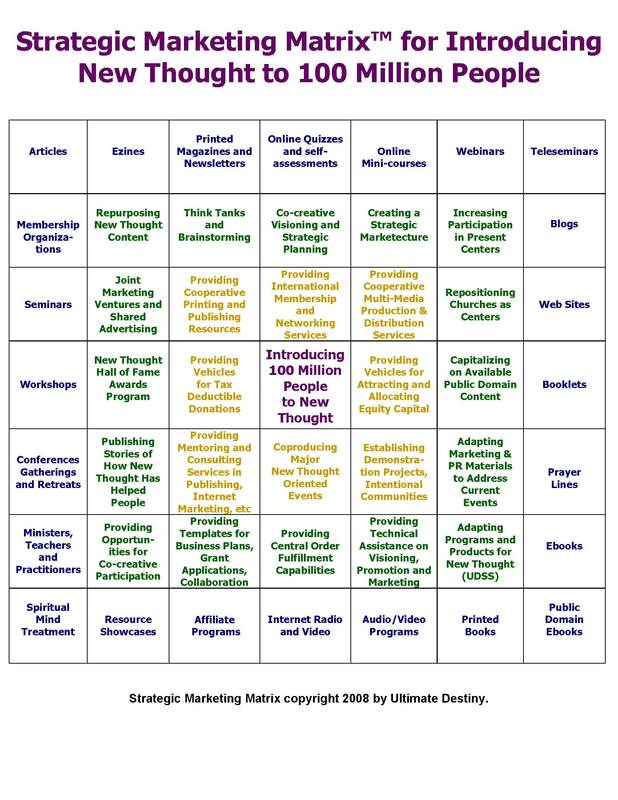 You can also Click Here to open a full page PDF document of the Strategic Marketing Matrix. Then there’s another 4,000,000 to 7,000,000 who hear his message every week on TV and radio. That’s amazing . . . and to us it suggests expanded outreach possibilities! Well maybe it is now time for New Thought to fulfill its ultimate destiny as a leading source of Love, Light and Wisdom in our world. God knows we could use some help. . . Ultimate Destiny University is seeking a few New Thought Centers to participate in an innovative “Ultimate Fundraising Program” that will help centers and their members grow and prosper. We are also seeking volunteers to help evolve and expand outreach and marketing efforts of New Thought Centers by establishing model Empowerment Training Mentoring Systems™ in your Center and or community. Ultimate Destiny University is grateful for the opportunity to donate our time, energy and funds to develop this web site and support the campaign to reach 100 million people with New Thought. To further support the campaign, we are about to publish New Thought 101 — Ways and Resources For Blessing Millions of People with the Spiritual Principles and Practices Known As New Thought. 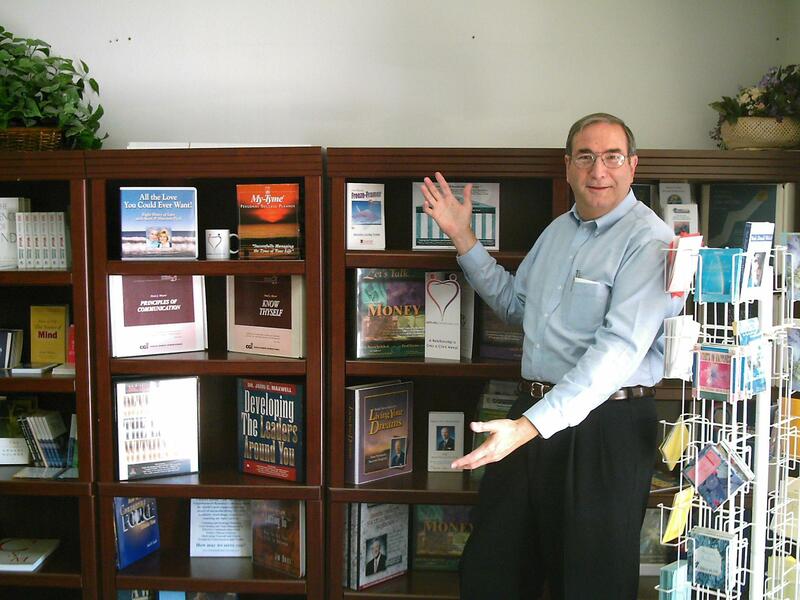 We invite your help in developing this “resource treasure chest” of books, classes, audio/video programs, live events, etc. For more information on Ultimate Destiny University, please download the 6 page PDF document, Welcome to the World of Ultimate Destinty. www.UltimateDestinyUniversity.com/new_thought.htm. Thank you! If you resonate with this vision, please read on and consider participating. At a minimum, we invite you to invest a few minutes of your valuable time to review any or all of the pages on each of the 24 proposed initiatives. You can also download a 1 page PDF flier that presents six of the major new proposals. You can use the comment feature on each page to share your feedback so we may be sure to include your resources and recommendations. We also invite you to complete the poll below to help identify the New Thought Ultimate Destiny Hall Of Fame Award recipients. Please feel free to contact us by phone or email if you have questions or suggestions. PS. If you know of other individuals or organizations who may be interested in participating in our New Thought Demonstration project, please do share this invitation with them. PPS. We also invite you to complete the poll below to help us discern collectively what authors, trainers and leaders in the New Thought movement (past and present) are deserving of special recognition as someone who is living (or lived if they have “graduated” from this plane of existence) their ultimate destiny while helping others manifest their own. Please select as many as you want and feel free to add more. Thank you! Click Here on the link to see a 2 page PDF with much of the information on this home page about the New Thought Demonstration Project. Click Here for a PDF of the 1 page Participation Form where you can share the resources you have created and or recommend for inclusion in this project. Click Here to donate to support this project and thank you! If you would like to have the main contents of this web site in a convenient 60 page PDF, Click Here to download it. It may take a few seconds to download. 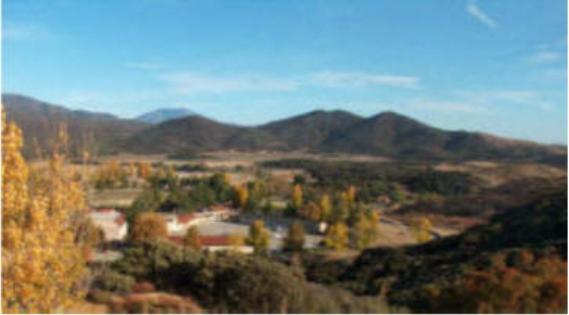 The most recent presentation of these proposals is included in the web site for Sedona Collaborative Enterprises. Please use the Contact Form below to share your contact information and submit any questions or suggestions. Thank you! I’m eager for the synergy of interaction and joint action that will come here and in many forms.